In Gmail, click on "view entire message" in lower left to see the complete email. Bar Mitzvah of Isaac Benjamin Cissna, Saturday, March 23, 10:00 am – This Saturday Isaac Benjamin Cissna, son of Jill Ory and Joe Cissna, will be called to the Torah as a bar mitzvah. Come celebrate with Isaac and his family and welcome Isaac as a member of our community! (2) Live the Chai Life! 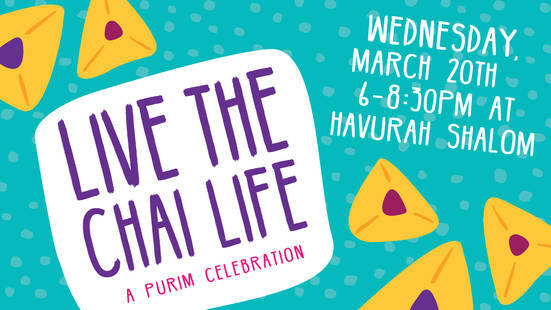 Purim Celebration, Wednesday, March 20, 6:00-8:30 pm – Come one, come all, for a night of joy, masquerade, and retelling the story of the courageous individuals from long ago whose valor saved the Jewish People. We will have pizza and vegetarian potluck, Megillah chanting, spieling, a costume parade, Hamantaschen contest, and dancing. 6:15 pm - Pizza will be provided by Havurah. Please bring a salad or vegetarian side dish if your last name begins with A-L. Bring a dessert if your last name begins with M-Z. (3) Havurah Sanctuary Committee Meeting, Thursday, March 21, 7:00-9:00 pm – Come learn with us as we prepare for the IMIrJ Advocacy Day in Salem. We will discuss the different House bills for which we will be advocating, Bob Brown will lead a workshop on the history and importance of Drivers Licenses for All, and Hank Kaplan will share with us tools on how to effectively lobby in Salem. In case you are wondering, it IS legal for faith communities to do lobbying. Participation in civic and public life is an integral part of many faith traditions. Advocating for legislative changes that align with our values is an important ­and legal ­part of that. Questions? Contact Bob Brown at rebrown47@gmail.com. (4) Tikkun Olam Global Meeting, Sunday, March 24, 10:00 am – The Tikkun Olam Global Meeting date and time has changed from the date posted in Hakol. It will be on Sunday, March 24, at 10:00 am. Tikkun Olam Global is a new Havurah work group focused on international social justice and issues related to global poverty and inequality. We take a holistic view of world as we endeavor to do our part to make it a better place for all. The planet is a village and everybody in it is our neighbor. Please join us as we discuss which international service project to focus on for the coming year. There are several exciting proposals under consideration. We need your ideas, enthusiasm, and skills. (5) Havurah Gardening Party, Sunday, March 24, 10:00 am–2:00 pm – Like digging in the dirt? Join a group of like-minded outdoors people for a tune-up of our lovely grounds. Contact Barbara Gundle at bgundle@gmail.com for more information. (6) Book Group Discussion of Quiet Americans by Erica Dreyfus, Tuesday, March 26, 7:00 pm – Dreyfus’s short stories tell of lives enmeshed in the Holocaust, scenarios that highlight the existential anxieties of Jewish Americans in the age of Hitler and afterwards. The characters include: a high-ranking Nazi wife and a Jewish doctor in prewar Berlin; a Jewish immigrant soldier and the German POW he is assigned to supervise; a refugee returning to Europe for the first time only to encounter the massacre of Israeli athletes at the 1972 Munich Olympics; a son of survivors who discovers long-held family secrets. These Americans are “quiet”—most don't talk about what they've been through, and some continue to be afraid. Deceptively simple, Dreyfus's tales reframe familiar questions about what is right and wrong, remembered and repressed, resolved and unending. Discussion will be led by Stacey Hankin. (7) Drawdown Book Discussion, March 28, April 25, May 23, 7:30-9:00 pm – There is way out of the climate change disaster. And there are many things we can do to have an impact. These solutions are addressed in depth in the New York Times best seller, Drawdown. We will meet to discuss the solutions and actions in Drawdown that can reverse climate change. Each meeting will have a reading assignment from the book. Please check the online event calendar for more information. Questions? Email Andy Beers at andy@andybeers.com. (8) Havurah's Evening at the Family Winter Shelter, Sunday, March 31, Cooking at 4:15 pm, Havurah Kitchen; Kid Host or Helping Hand at 6:30 pm, Family Winter Shelter for Portland Homeless Family Solutions – We have now had two successful collaborative cooking sessions using the Havurah kitchen preparing dinner for the families in the Family Winter Shelter. Some of us bring the meal over to serve. Others join as "kid hosts" playing with the kids in the shelter, and others work as "helping hands," helping out with whatever needs to be done. The next date Havurah has signed up for is March 31. If you want to be part of this event, please sign up at this link or contact Deborah Mandell at deborah.mandell@gmail.com. (9) IMIrJ (Interfaith Movement for Immigrant Justice) Advocacy Day, Monday April 8, 8:00 am-4:00 pm, Salem – Join Rabbi Benjamin and members of the Sanctuary Committee as we participate in the IMIrJ Advocacy Day in Salem. We will come together with people of faith and conscience from across the state to meet and build relationships with our Oregon state senators and representatives to amplify the demands and priorities of Oregon’s immigrant and refugee communities. A key issue we will highlight is the Equal Access to Roads Act, which would ensure standard licenses are available to all qualified drivers regardless of their ability to prove their status. Register to attend here. Carpooling is available. Questions? Contact Kathy Gordon (farvergordon@gmail.com) or Shari Raider (shari.raider@gmail.com). (10) Kabbalat Shabbat, Friday, April 12, 6:30 pm Dinner, 7:30 pm Service – Join us for a catered vegetarian dinner at 6:30 pm, followed by a short, musical service at 7:30 pm. RSVP here for the dinner by Sunday, April 7. For cost adjustments, call 503-248-4662 ext. 2. No RSVP is required for the service. Just join us as we welcome Shabbat! Childcare is provided. (11) Make New Connections at Kabbalat Shabbat Dinners – For the next three months, Kabbalat Shabbat dinners will be offering an opportunity for members to meet “new faces” and make new connections within our community. This is entirely optional, we know that these dinners provide a welcome opportunity for many to catch up with old friends. For members who choose to participate, we will offer reserved seating at “New Connections” tables, where you will have an opportunity to talk to someone you do not know, or do not know well. The new Kabbalat dinner form will have a place for you to indicate if you wish to be seated at a New Connections table. For further information contact Susan Lazareck, susanlazareck@gmail.com, or Judy Steinberger, jlasteinberger@gmail.com. (12) Have a Question About Havurah? – The Transparency/Inclusivity Committee welcomes your questions! We will find the answer and publish the question (but not the questioner) and answer in an upcoming Hakol. It is our intention at Havurah that what you know and understand about our congregation should not be a function of who you know. So if you find yourself wondering about something related to Havurah, or if someone shares their question with you, we hope you will send your question to transparency@havurahshalom.org. (13) Looking for B'nai Mitzvah photos for Michele Goldschmidt's Celebration – Did your child have the pleasure of having Michele Goldschmidt be their b'nai mitzvah tutor? We are collecting photos for her celebration on April 6. No commitment is required beyond emailing a few pictures from your child's bar/bat mitzvah to racheli.karlinskyross@gmail.com in the next couple of weeks. Thank you in advance! (14) Enrollment in Havurah's Shabbat School for 2019-20 – We are currently planning for next year’s Shabbat School, our cooperative Jewish education program for children and families. If you have a child who is entering grades K-6 in the autumn of 2019-20 and are considering having them participate, please note that May 1 is the enrollment deadline to become Havurah members and enroll in Shabbat School. Learn more here. (15) American Sign Language (ASL) and the High Holidays – In the past, Havurah has provided an ASL interpreter during High Holiday services. We would like to know if that accommodation would be appreciated or needed this year, so we can budget ahead for it. If you or another High Holidays attendee would benefit from an ASL interpreter, please email Rachel Pollak (rachel@havurahshalom.org). (17) Heads up: Lost and Found will be Emptied Soon – The Lost and Found box has gotten very full again! Please take a moment to root around for your lost gloves, water bottles, scarves, toys, glasses, and other items. Anything remaining in the box will be taken to Goodwill after April 15. Contact Rachel Pollak at rachel@havurahshalom.org with concerns. This is also a great time to look through the closet for coats you have left. (4) Little Shtetl on the Prairie: Reckoning with the Past Through Teshuvah, Wednesday, April 10, 12:00 noon–1:00 pm, Oregon Jewish Museum and Center for Holocaust Education – Havurah member Rebecca Clarren, an award-winning journalist, will present a free hour-long slide show and talk. Clarren's relatives escaped pograms in Russia and became Jewish ranchers and homesteaders in South Dakota. Throughout her childhood, Clarren was told stories of their fortitude and luck – stories of her uncle "Bronco Lou" and the mikvahs her great-great-grandmother took in the ice-choked creek behind their shack on the prairie. Yet among the narratives that were never shared were stories of the Lakota, their neighbors. In an effort to better understand the truth of the past and possibly find some healing, Clarren, who has written about Indigenous Americans for national magazines such as The Nation, Indian Country Today and High Country News, set out to find the descendants of the Lakota families who were displaced and harmed by the amoral land allotment policies which provided her family with free land. The program, funded by a grant from the Regional Arts and Culture Council, is part of the OJMCHE's brown bag lunch series. Learn more here.